Have you ever imagined yourself in a Hollywood studio? Then, your dreams can come true with the latest Elk Studio slot machine, Platooners. Find everything about the newest game in the article below. Lights, cameras, action! Would you like to be the producer of your own fantastic gambling adventure? Platooners is an action movie with three recruits armed with impressive weapons, like grenades, rockets and heavy guns. They fight with three gold snakes in order to discover the hidden treasures of the jungle they are in. 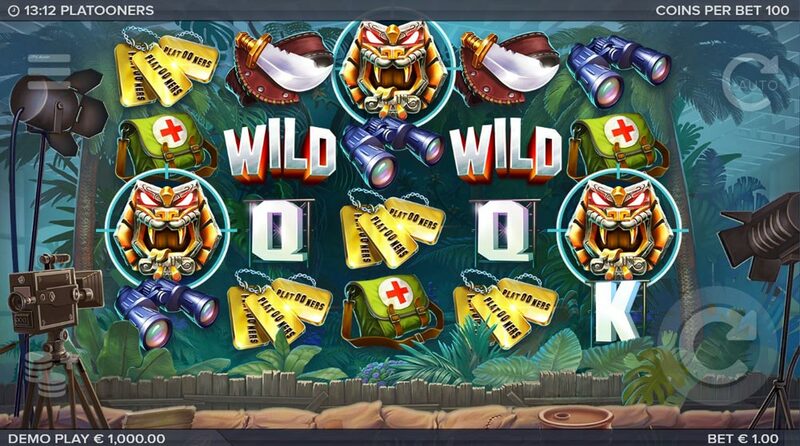 An exciting 5-reel slot with 4 rows and 178 winning options, Platooners invites you in its full of adventure world. The slot has amazing graphics, benefiting from astonishing animated characters and a great sound variety which transposes you in the plot. The game can be played on desktop, smart phone, laptop or tablet and the minimum amount you need to spend on a spin is only 0.2 EUR. It also has a maximum amount per spin and that is 100 EUR. When the three Platooners release their weapons, they release respins, additional wilds and pay-lines. Yellow Gun Machine Platooner: it launches bullets on reels 2, 3, 4 & 5, generating a minimum one five of a kind line. With a maximum win of 2 500X, you needn’t waste your time. Charge your batteries, enter the adventurous world of Platooners, make some noise with your weapons and win a great amount of money!